For over half a century, Barden has used their state-of-the-art production facilities with the latest, cutting edge technology, the highest quality materials and systems todesign and build the finest custom commercial buildings in the industry today. Barden Commercial saves you substantial time and money on your building project, and we make the process easier for you! Our basic custom-designed approach and system promotes the fastest, most complete and economical construction project. Call us today for more information 607-423-5365! 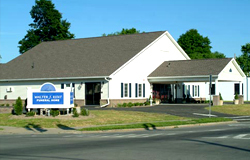 When I considered building a funeral home, I looked at many different possibilities. For me, Barden Commercial had what I was looking for in a building. I visited the Barden manufacturing facility and was impressed with their process. They designed the building just as I had sketched it out for them. They made some welcome suggestions and refinements to the structure. I chose what I wanted and was involved in the entire process.